With organic food becoming a bigger and bigger part of people's food budgets, factory farms are moving into organic in a big way. 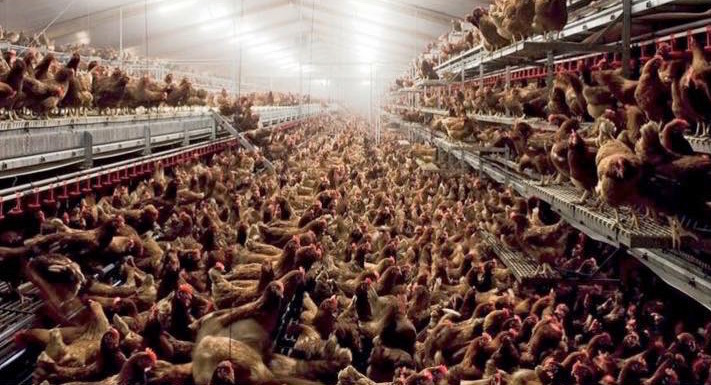 The problem is, they also want to bring their industrial practices—use of chemicals, monocropping and gigantic scale of production ("free range" chickens, above). The current administration's takeover of agricultural regulatory structures has meant that these industrial giants are now in control and looking to stop any changes that may cut into their profits. Matthew Dillon, director of agricultural policy and programs at Clif Bar, offers his take on why the organic industry is suing USDA for delaying the organic animal welfare rule. Sam Walton once said, "If you don’t listen to your customers, someone else will." It’s an often-repeated axiom in the business world and points to how easy it is to lose consumers if you go deaf to their point of view. Today, the U.S. Department of Agriculture (USDA) is losing touch with its customers—the American public. Matt Dillon of Clif Bar. In the organic trade, the consumer has spoken often and spoken loudly. When the initial proposed organic rules were introduced nearly two decades ago, more than a quarter million consumers commented on the rules—an epic number in the days before one-click activism, and the most the Department of Agriculture had ever received to date. The USDA listened and amended the proposed rules based on this public input. With their wallets and voices, the public continues to advocate for a strong and robust organic seal. Unfortunately, the USDA isn’t following the tradition of listening to its customers. In a 60-day period in spring 2017, the USDA received more than 45,000 positive public comments from farmers, consumers and food producers, agreeing with proposed rules to improve animal welfare, particularly increased pasture access for poultry. Its customers—the public—have spoken, but unfortunately, it seems, they have not been heard. 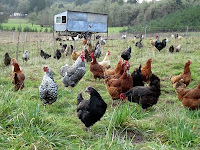 Pasture-raised chickens are part of a rotational grazing system in Scio, Oregon. 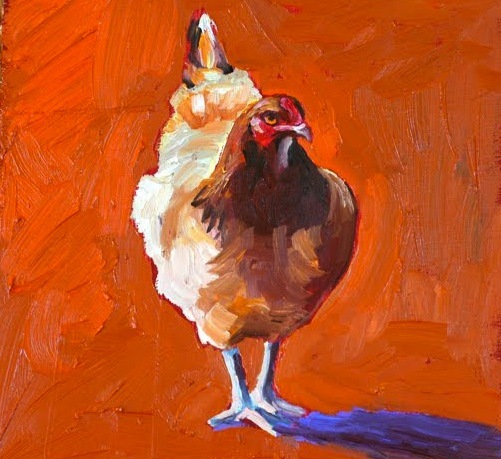 These animal welfare rules, known as the Organic Livestock and Poultry Production rule, have been carefully crafted over a 14-year process of listening to farmers, food companies, retailers, scientists, animal welfare advocates and consumers. They were reviewed, revised and reviewed some more before being finalized in 2016. These final rules were scheduled to go into effect in January 2017. 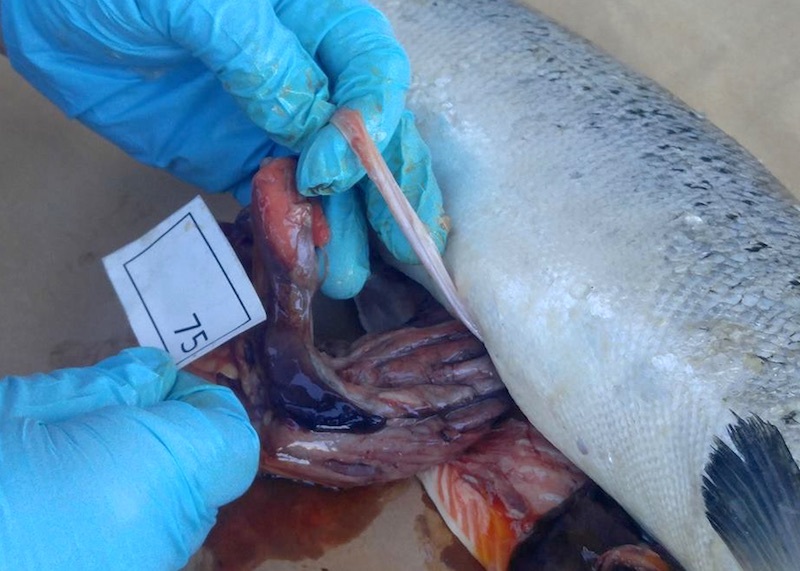 However, the USDA has not followed the Administrative Procedure Act and has repeatedly and seemingly indefinitely delayed implementation, without appropriate public input. 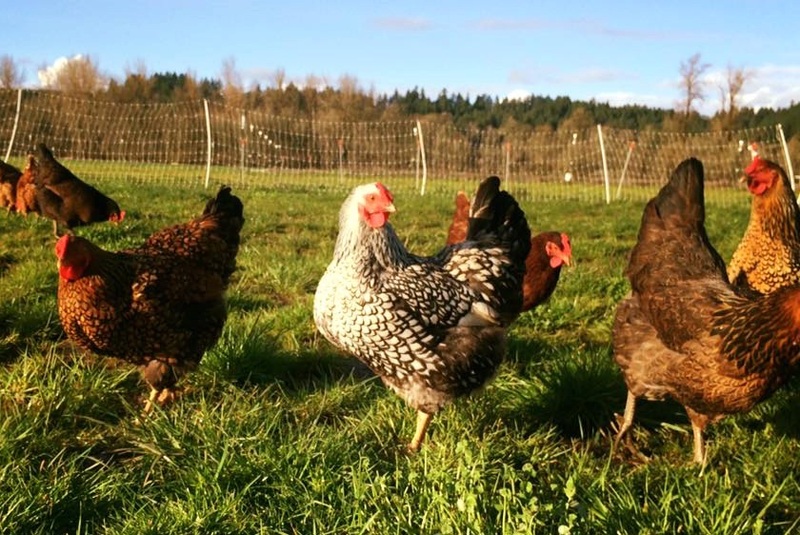 Instead, USDA is listening to a few massive egg producers that want to increase sales into organic markets but not incur the costs of higher animal welfare standards. 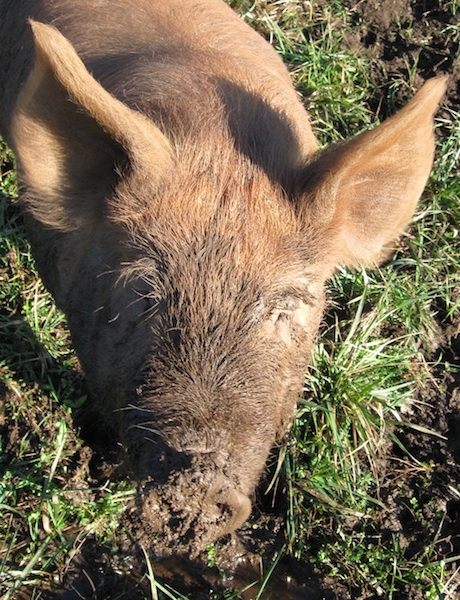 For this reason, the Organic Trade Association is suing the USDA for repeated delays of Organic Livestock and Poultry Production rule. 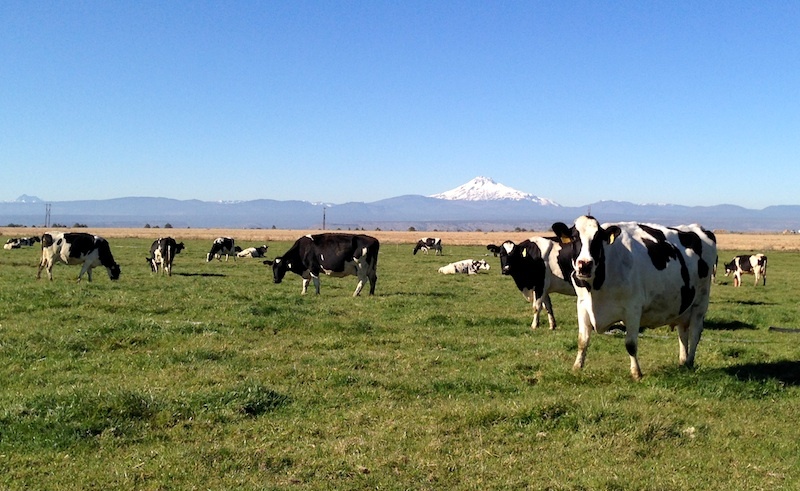 Organic, pasture-raised dairy cows at Jos L. Poland Dairy in Madras. The company I work for, Clif Bar, doesn’t raise chickens or use eggs in our product. Our business is not directly impacted by organic poultry rules. So why are we joining the Organic Trade Association and the public chorus who have voiced their concern with the rules? It’s simple: The lack of rule-following by USDA threatens the very integrity and trust that differentiates the organic seal from every other food label. Organic customers want organic farming to continue having the highest standards—and they believe that the historical process of organic rule-making, which includes listening to the customer, needs to be maintained if the organic label is going to continue being a trusted standard. The success of thousands of family organic farms and decades of hard work by consumers, farmers and food companies is at stake. While the organic community doesn’t always align on everything, we all agree that the future of feeding Americans with healthy, sustainable food requires a robust and trustworthy organic seal. The American public has spoken. USDA must heed Mr. Walton’s advice; if the USDA doesn’t listen to its customers, someone else will. 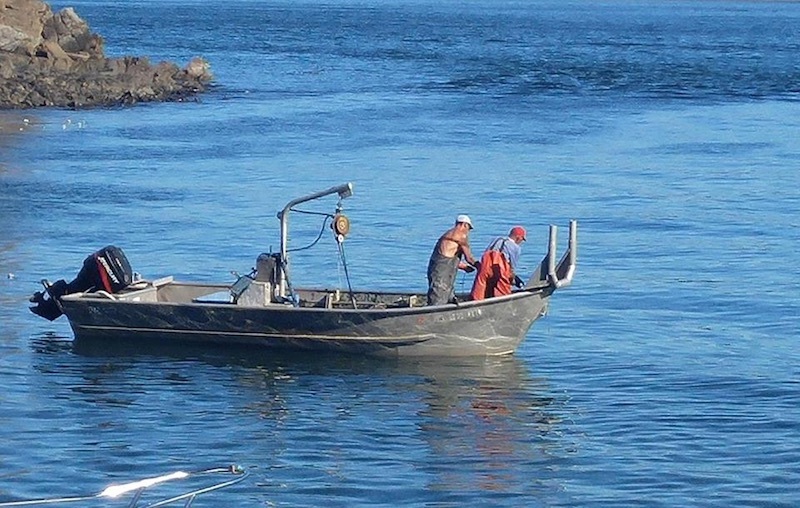 This essay is reposted from the New Hope Network. In yet another example of the old saw "it isn't what you know, but who you know that counts" my neighbor Bill, he of the pickled onions, bourbon cocktails and massive garden, has been evangelizing on the topic of shrubs ever since I'd met him. 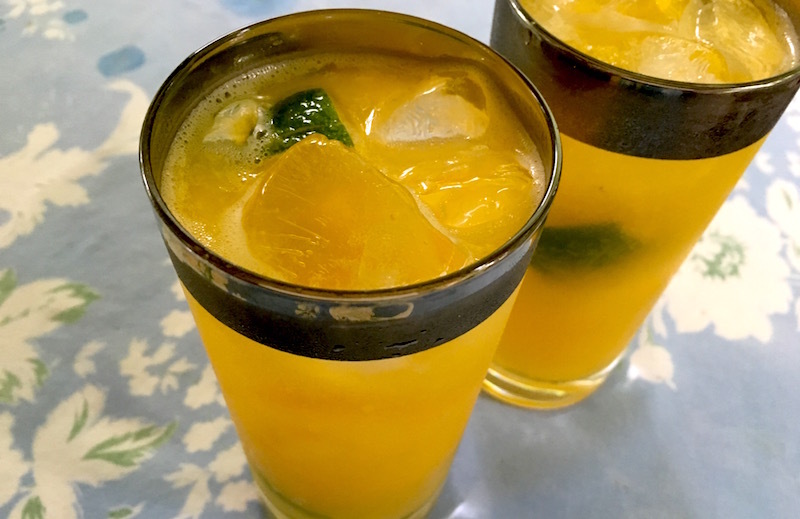 No, not "shrub" as in a bushy landscaping plant, but a fermented vinegar syrup made by combining fruit and flavoring ingredients like spices or herbs with vinegar. I was finally inspired to dive in when I visited him in his kitchen and he showed me a bowl of cubed cantaloupe he'd mixed with sugar that was sitting on the counter, and a separate bowl of mint that had been bruised and combined with some white wine vinegar. "Okay, now, that doesn't seem to scary, " I said to myself. And when he mentioned that all that remained to do was to leave it out overnight, then strain the solids off, combine them in a jar, and let it sit for a couple of weeks in the fridge, I got that heady feeling I remember from my childhood when I rode a two-wheeler for the first time. So stay tuned for more shrubs made with different fruit—I'm jonesing to try it with the Ayers Creek Farm's Chester blackberries I have stashed in the freezer—and ideas for using it in "acidulated beverages." 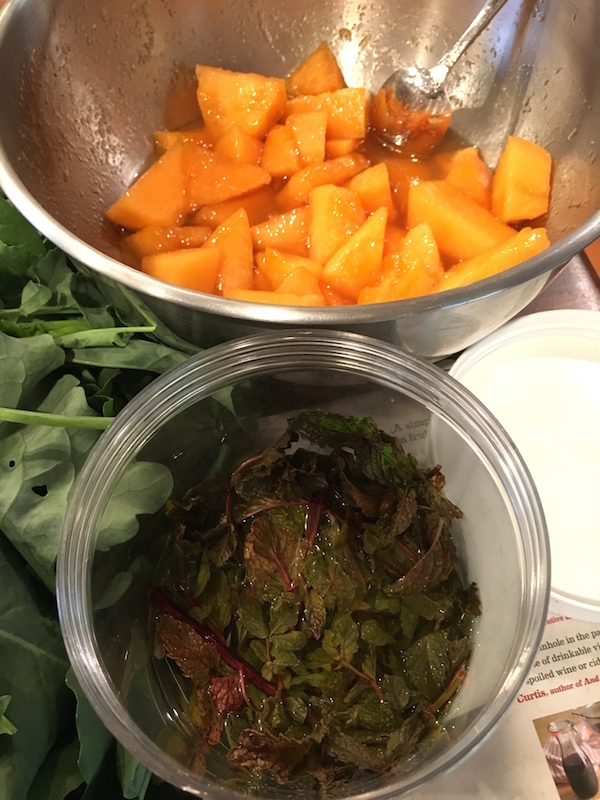 In a medium-sized non-reactive mixing bowl, combine the cantaloupe with the sugar. Cover and allow to macerate on the counter overnight. Put the mint in a small non-reactive mixing bowl, add vinegar and muddle lightly to release oils. Leave on counter overnight. Strain off liquids from both bowls and pour into lidded quart jar. (Lid should be slightly loose to release gasses.) Place in refrigerator for two weeks. Shake periodically, tightening lid before shaking. Loosen lid again when replacing in refrigerator. Fill a cocktail shaker 3/4 full of ice. Add ingredients. Shake and strain into coupe glass. 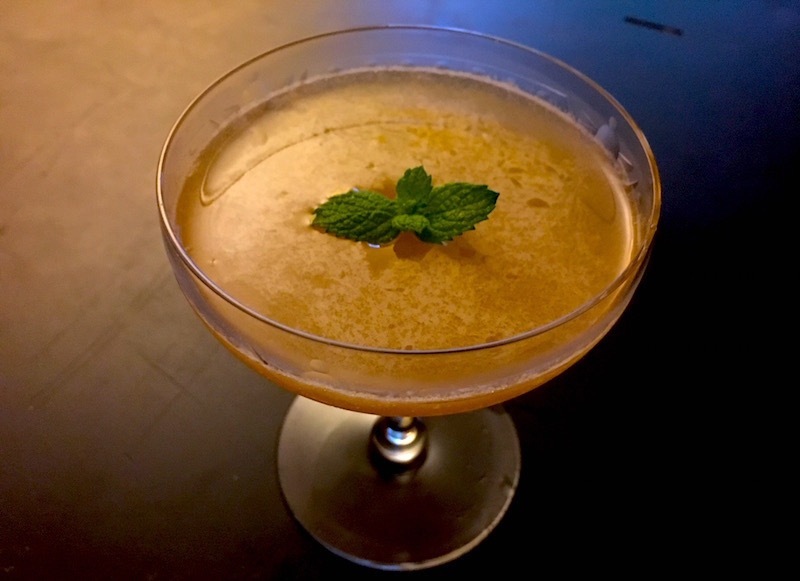 Garnish with sprig of mint. Fill beverage glass with ice. Pour in shrub, then fill with club soda and stir to combine. Squeeze lemon wedge into the glass and drop it in. In a recent edition of the New York Times, wine editor Eric Asimov waxes poetic about Oregon wine, saying that "Oregon is right now the single most exciting winemaking area in the United States," that "nowhere else does the level of quality seem so high, the perspectives so diverse or the experimentation so fierce as it is in Oregon right now." 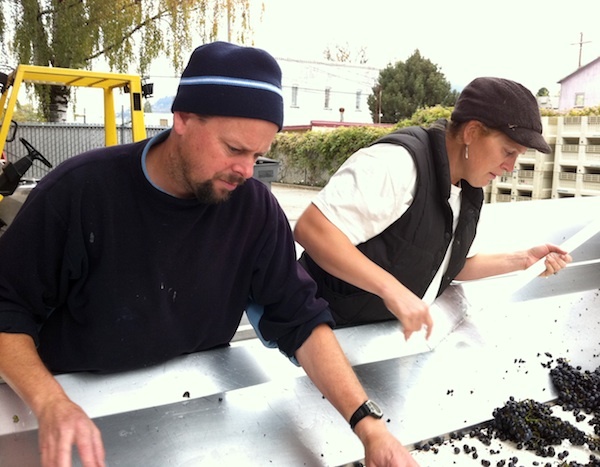 He goes on to extoll several of our best winemakers, especially Brian Marcy and Clare Carver of Big Table Farm. Here's an article I wrote about them seven years ago. Nice that Mr. Asimov has caught up! Clementine, the Catahoula leopard hound, has been anxious since dawn, not wanting to be too far from her owner, Clare Carver of Big Table Farm. Clare has been moody for the last couple of days. Even Clare’s husband, Brian, has been giving his wife a wide berth. When Clare goes up to the hill pasture to sit with her pigs, Picnic and Pancake, Clementine stations herself with a good view of the road. She knows something is coming, something that is making Clare sad, and she wants to be ready. Clare Carver sits in the pen with her pigs, scratching their backs when they lean their 300-pound bodies against her, snorting and squinting in the bright sunlight. Like a couple of big dogs, they dash off to play with each other or to chase something in the bushes or to root through the grass in the pasture, but eventually they come back to get more attention from Clare. She's raised them from tiny weaner pigs, and today is their last day. An inspired painter whose subjects are the cows, horses, chickens, goats, pigs, old trucks and tractors that populate the farm she owns with her husband, Brian Marcy, in Williams Canyon outside Gaston, Oregon,she also has a large vegetable garden that supplies most of the couple’s food and the large farm dinners they host for people who buy the wines Brian makes under the Big Table Farm label. Growing up in a large Catholic family (she has eight brothers and sisters), Clare heard stories about the farm in upstate New York that her parents had bought in the late 50s. They sold the farm when Clare was seven and moved their large family to the suburbs of Valley Forge, Pennsylvania. “It was a complete wake-up call,” Clare said. 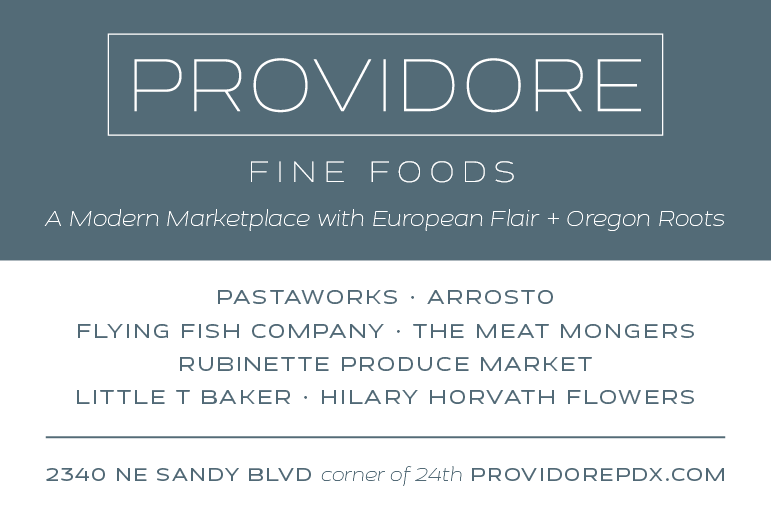 She sold all her belongings and moved to San Francisco to start her own business. Shortly after the move she began dating Brian, who was transitioning to making wine after working for several years as a beer brewer. Their move to Oregon was prompted, oddly enough, by a season spent harvesting grapes in Australia. Their requirements for their farm were fairly simple: It had to be within an hour of a big city so Clare could continue her graphic design business, it needed to be located in a wine-producing area so Brian could be a consulting winemaker while developing their vineyard and, of course, it had to be within their budget. 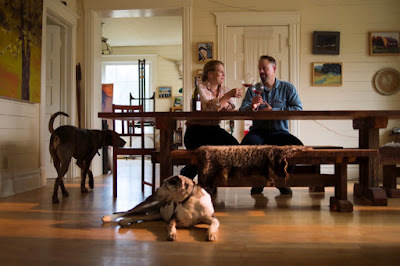 The farm they found in 2006 fit their list to a T: Close to Portland, it was in the middle of a burgeoning wine region. It had perfect southeast facing hills and a charming Victorian farmhouse. Their bid was accepted. While the book is mostly about what Pollan believes is the broken food system in the United States, where people are disconnected from the sources of their food, he also writes about a visit to Polyface Farm in the Shenandoah Valley and farmer Joel Salatin. Salatin calls himself a “grass farmer” and believes in rotating the animals on the land to keep the soil and the plants, and thus the people who eat the animals and plants, healthy. With Salatin’s principles in mind, they’re transforming the nearly ruined hillsides and pastures of their Big Table Farm to an organic, balanced system. Brian made a trailer, called the “chicken bus,” to transport their laying chickens from one area to the next. Goats clear blackberries and scrub, watched over by a “guard llama” who challenges any predators who get too close. The cows, pigs and Clare’s beloved draft horses are confined by electrified tape that can be easily moved when the pasture needs a break from grazing. 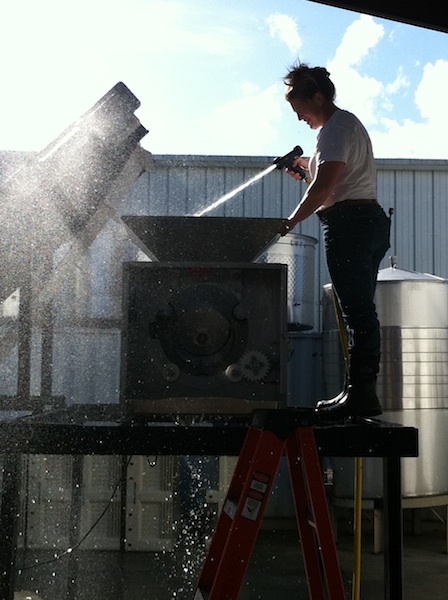 When Salatain made a trip to Oregon, she asked him about organic feed, an important part of the system at their farm. Salatin’s answer? “People can handle nudists and they can handle Buddhists, but they can’t handle nudist Buddhists. She told Salatin that while that might be the case in his home state of Virginia, she felt that Northwesterners were able to handle that kind of information. Like the fact that she flat out refuses to send any of her animals to processing facilities to be slaughtered. Take pigs, she said. They’re very smart and sensitive, so when they’re put into a truck for the first time in their life, it’s terribly stressful. And a pig’s sense of smell is even keener than a dog’s. Because strict federal regulations require any meat that is sold to the public has to be processed in a USDA-approved facility, the meat from her pasture-slaughtered pigs can’t be sold in supermarkets or at farmers' markets. This is despite the growing demand for just the kind of pasture-raised meat she and other small-scale farmers in the region are producing. 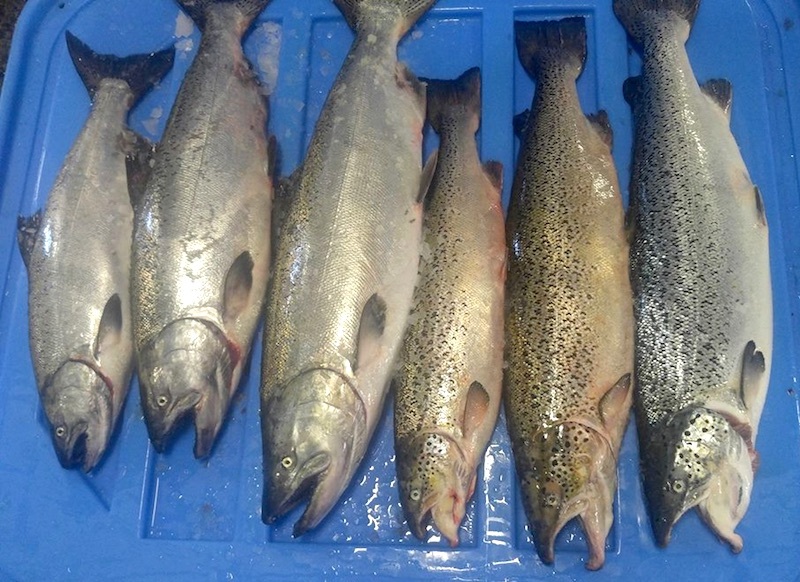 With small processing plants closing down because of the recession, it’s hard for small producers to get their animals into larger slaughter facilities. With just a handful of USDA-approved mobile slaughter trucks in the entire Northwest, there isn’t one available for Clare’s farm. Which brings us back to Clementine standing watch and Clare waiting with her pigs in their hillside pasture. When the truck from Frontier Custom Cutting finally pulls into the driveway in the late morning, Clemmie starts barking. She won’t stop until it leaves. Richard, a burly man wearing orange rubber overalls and carrying a black rifle, walks up the hill. While Clare distracts Picnic with some fresh eggs, Richard puts the rifle behind Pancake’s ear and pulls the trigger. Then he walks over to Picnic munching on her egg and does the same. Clare feels it’s the most respectful way to kill them. “The bullet goes right to the spinal cord, but their heart is still pumping, so they’re essentially brain dead,” she said. “It’s a little violent but it doesn’t last very long. That part is the part I hate to watch, but dying is dying and it’s not pretty. It is what it is. And each time she allows herself to feel the loss. “It’s the way you feel when a human dies. They’re gone…really gone,” she said. ”I go out to their pasture the next day and I’m like, oh, they’re gone. It’s a reminder of how much power we have and how careful we have to be of that power, that we just created and took this life. An observer could note that, in the way they run their farm and raise their animals, she and Brian haven’t chosen an easy route. And, like the move to Oregon and buying the land, it’s all been done without a business plan. “If we had a business plan some things might be smoother for us,” Clare said. “But, like anything in life, it’s like, ‘Well, I’m going up that hill and maybe I’m not going to take the straightest path. But maybe I’m going to see some things I didn’t expect if I don’t have an exact map of how I’m going to get there. Asked about the best part of their lives on Big Table Farm, she thought for a moment, then answered. Top photo by Amanda Lucier for the New York Times. 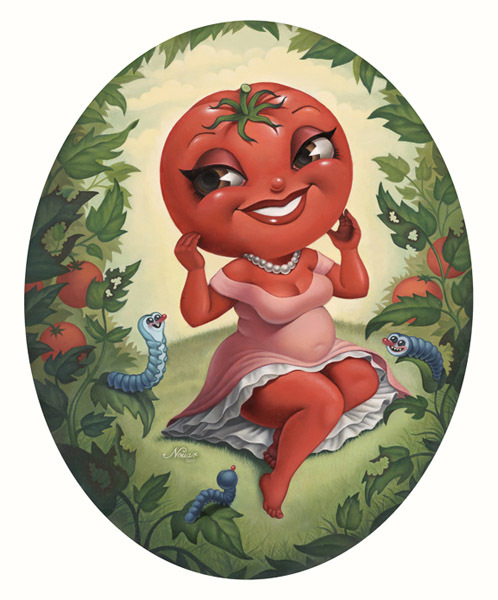 "And now for your delectation, the delicious Tomatoes Galore will tickle your fancy with her juicy rendition of 'On Top of Old Smoky'…"
Forgive me, dear readers, but I'm in head-down tomato processing mode. I've got two baking trays of chopped tomatoes in the oven that need to come out in 30 minutes, so this is going to be quick. They're the tail end of 60 pounds of the red-ribbed beauties known as Astiana tomatoes from Ayers Creek Farm, the first round of the 150 pounds I plan to process (I know, crazy, right?) this year and squirrel away in the freezer for the winter. Astiana tomatoes at Ayers Creek Farm. 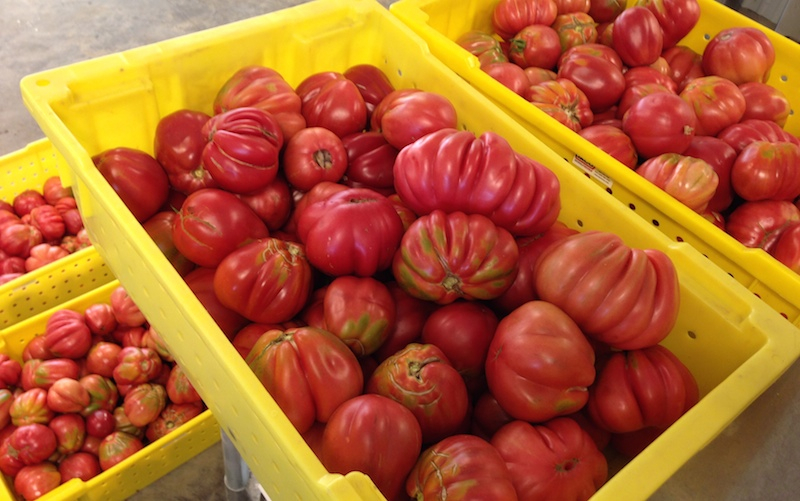 Those tomatoes, with just the right balance of tart-to-sweet, the product of more than a decade of selecting for flavor, plant health and field-hardiness on the part of Carol and Anthony Boutard, began with a meal that the couple had in the Piedmont region of Italy. There they tasted a fresh tomato that Carol said they had to bring back to their organic farm in Gaston—Anthony would remind me that Italy's Piedmont is on roughly the same latitude as Oregon, meaning that the seeds could be adapted to our climate—and the story goes that she ran out to the dumpster behind the restaurant, diving in to gather enough seeds to bring back. Roasted tomato soup (recipe below). My method of roasting is super simple: preheat the oven to 400°, chop the tomatoes into quarters, load onto two sheet trays skin-side down and roast for an hour. Cool enough to pull most of the skins off (easiest by hand if you like chunky sauce; a food mill smooshes them too much for our uses), load into quart freezer bags and you're done. Speaking of done, it's time to pull those tomatoes out of the oven. 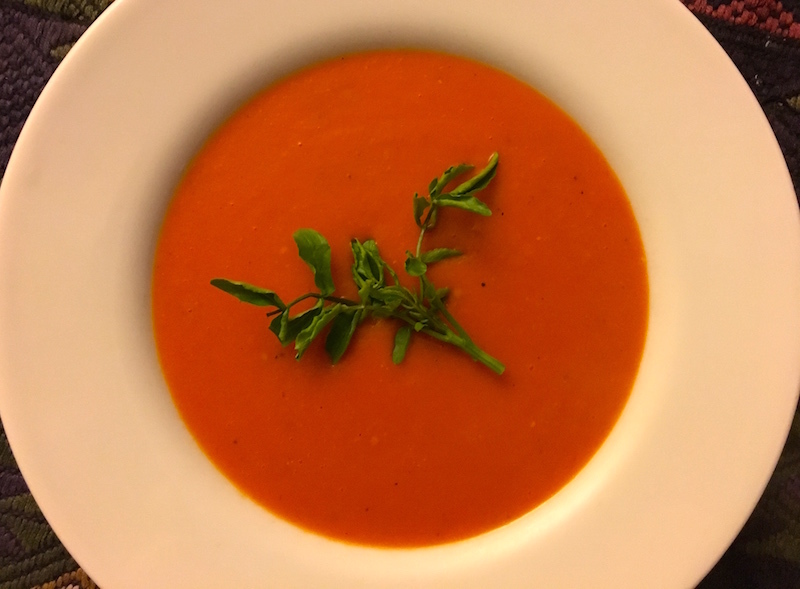 Here's a recipe for a fabulous tomato soup I made last year, one that I think rivals the best you're likely to have. In a Dutch oven or large soup pot, melt butter over medium heat. Add onion and sauté until tender and translucent. Add garlic and continue to sauté 2 minutes. Add flour and stir, making sure it doesn’t stick to the bottom of the pan, for 3 minutes. Add broth, tomatoes, salt, celery salt and pepper. Bring to a boil, then reduce heat to simmer for 30 minutes, stirring frequently to make sure nothing sticks to the bottom of the pan. Remove soup from heat and, using an immersion blender, purée the soup thoroughly until smooth*. Add more salt to taste, if needed. Serve. * I don't mind a little texture from any bits that don't get totally blended in, but if you want a completely silky smooth finished product, you can press it through a fine mesh sieve, which will catch any remaining seeds or other bits. Peaches are the most seductive fruit of summer: Their aroma, when ripe, is both tart and intensely, beautifully sweet. Just one sitting on my counter can perfume the whole kitchen. Apply slight pressure at the top, near the crown, and the flesh beneath the skin gives way slightly; peeling it is like slipping off the clothes of a lover. So the end of summer, to me, is about peaches. In cobblers and salads, stirred into the batter for scones, churned into sorbet, mixed into cocktails we carry out to the front porch and toast our neighbors passing by. Place half peach in a blender and purée. Add a few drops of lime juice to keep it from browning. Trim ends off of lime so white rind is gone. Cut lengthwise and remove pith from center. Slice almost all the way through perpendicular to axis of lime, leaving rind side intact. Slice diagonally a couple of times, again, not slicing through. Cut in half, perpendicular to axis and put in glass, flesh side up. Put sugar over lime. Muddle gently, squeezing out all the juice you can. Add puréed peach. Put into shaker. Fill with ice. Add the cachaca. Shake. Pour with ice into tumbler. See all my peach recipes here! There's no other way to say it: I am devastated. The Eagle Creek Fire in Oregon's Columbia River Gorge is turning a lifetime of memories to ash. The geography of a life spent traveling its trails, byways, forests, streams and rivers is being consumed in fire. 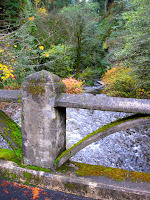 Childhood trips to Multnomah Falls to stand on the dainty Benson Footbridge gaping at the impossibly high water cascading over a cliff and thundering into a pool far below, then having a lunch of luscious salmon sandwiches—so much more decadent than our standard Bumble Bee—in its stone lodge. 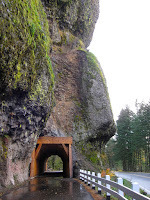 Stonework on the old highway near Oneonta. Driving up and down its length to Eastern Oregon for family holidays with grandparents, then, later, riding the Greyhound home from college after my folks moved to The Dalles. And after college, that drive, always fraught in the winter months, not sure what challenge we'd face between Cascade Locks and Hood River. Blinding snow and black ice, driving winds that would buffet my little car like it was in a pinball machine at the mercy of a demented player. 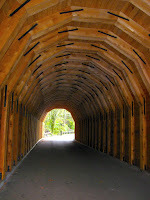 Oneonta tunnel, before the fire. 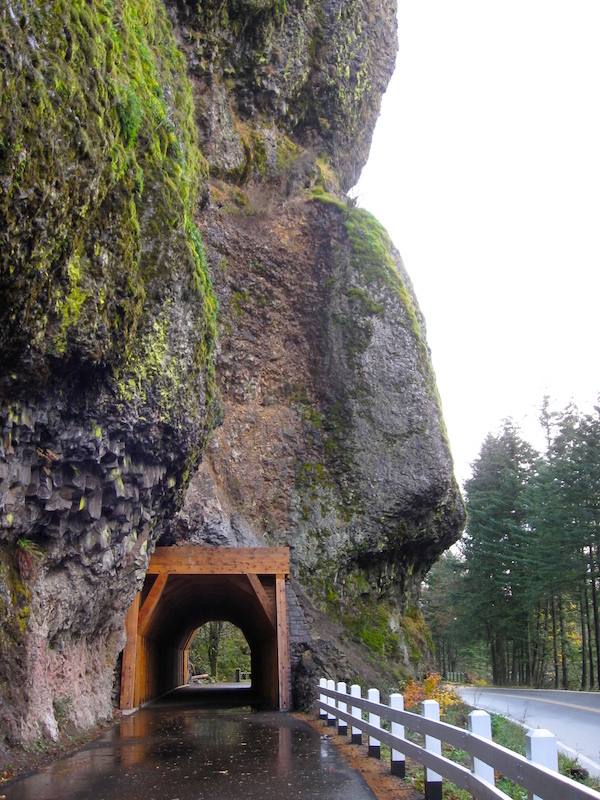 The stunning beauty of the soaring rock cliffs shooting up from the wide expanse of the river, sheer expanses carpeted in Douglas fir and dotted with little towns—Bridal Veil, Dodson, Warrendale—along the way. Growing up, a stop at the Charburger in Cascade Locks for coffee and, if we begged enough, a piece of pie, was de riguer; a tradition that Dave and I continued for years with our own son. Spectacular woodcraft in Oneonta tunnel, now gone. We'd see its hills change from the pale green of spring to the richer hues of summer, then explode into the vibrant palette of fall. A profusion of lupine, daisies, penstemon, vetch, buttercups, Douglasia, kitten tail and other wildflowers would dot creeks and roadways, trees cackling with birdcalls. 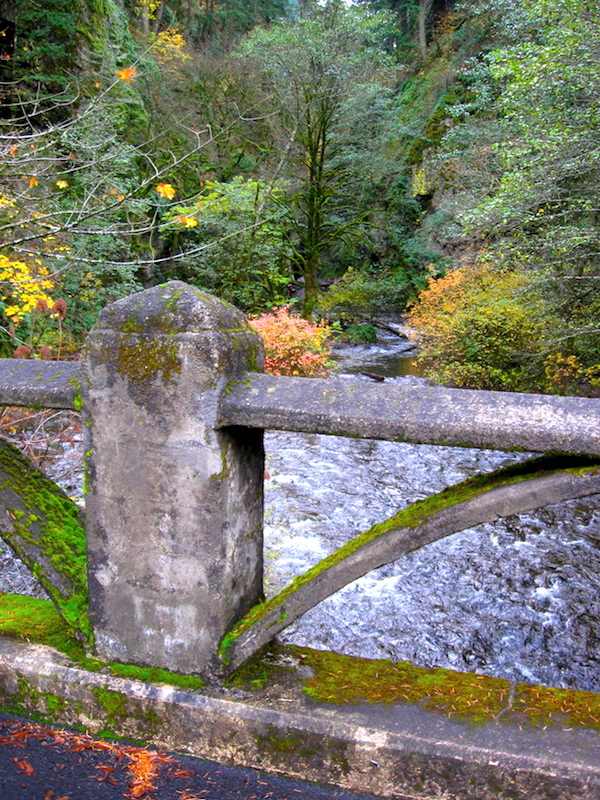 It was a gem that we'd reveal to visitors, saying, "Oh, let's drive to Hood River for a beer," then stun them with stops along the historic highway, listening to them gasp at its waterfalls, as we'd tell them about the Italian stonemasons who crafted its moss-covered parapets, railings and bridges. 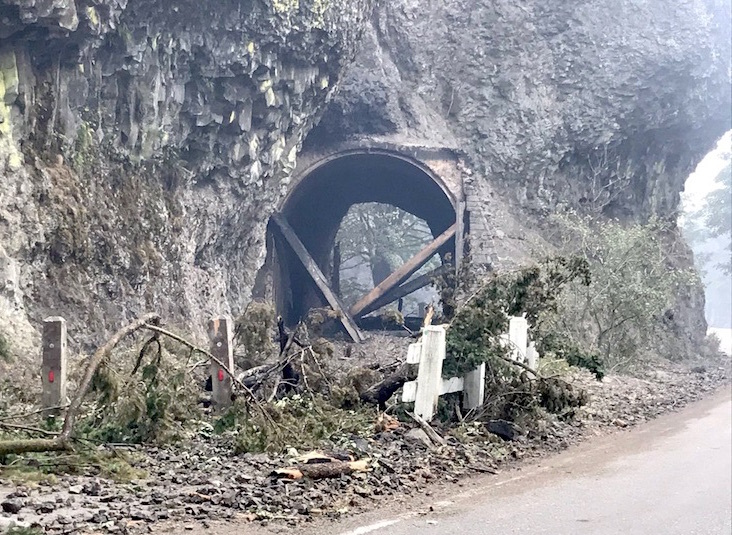 Oneonta tunnel after the fire. As my brother said, "A big part of a lot of our lives lies in ruins." It will take at least a generation, or more, to recover. Donations can be made to Friends of the Columbia Gorge, designated to search and rescue operations, or to Trailkeepers of Oregon, which will be working on restoration efforts. Video at top from 2010. This summer is going down in the record books as a weird one, for sure. For the first time ever, I walked on the Oregon coast and, rather than the cool breeze wafting from the ocean, I felt a hot, suffocating wind blowing from the shore. For the last month we've had wildfires burning up and down the Cascades, bringing smoky skies for days at a time—last night the moon looked like a tangerine floating over the city—and today our neighbors' houses a block away are veiled in a grey haze. Temperatures in the Willamette Valley have reminded me of my summers in Eastern Oregon more than the moderately balmy summers we're used to, and we've had to deploy fans and a window air conditioner to keep the house at a livable temperature for the pets and people inside. The balm to all this Shakespearean drama in the weather has been, for us, the simple pleasures of late summer that we look forward to all year, exemplified by big, sweet tomatoes sandwiched between thick slices of country bread and the perfume of fleshy peaches eaten out of hand, bursting with sticky juice. Just this morning I was down at our neighborhood farmers' market to pick up fresh corn, shiny deep purple eggplants and big heads of lettuce so alive I half expected them to speak to me. Dave had put in a request for fruit for sorbet, so a box of blushing Sweet Soleil peaches was dutifully purchased for that purpose. He's just finished churning the first batch, and I can't wait to have an icy dish on the porch after dinner as we wait for the first breath of the evening's breeze. Pit and quarter whole peaches, leaving skins on, and place in food processor with lime juice and sugar. Process until it's a fine purée. Pour it into a fine mesh sieve (in batches if necessary) over a large mixing bowl and, using a wooden spoon, stir and press the purée through the sieve. (This step is super easy and not time-consuming, so don't let it put you off.) Stir in the bourbon, then place a piece of plastic wrap directly on the surface of the purée. (This keeps it from oxidizing and turning brown.) Place the bowl in the refrigerator for 2-3 hours to chill completely. 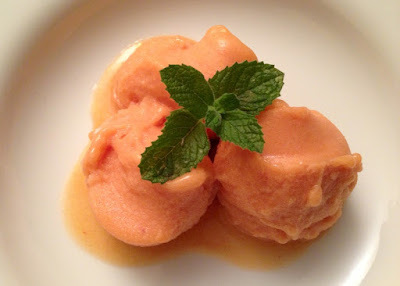 Put chilled purée in ice cream maker and process according to directions. Place in container in freezer for 2-3 hours (or overnight), then serve.